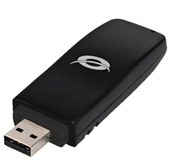 With this WLAN stick of Conceptronic you do not only bind your "Conceptronic TV FULLHD STREAMER GBIT LAN" into your existing WLAN network, but also your PC or laptop. By the WPS function the configuration of the stick is settled only with a push of a button. The high transfer rate of maximum 300 MBit/s enables a powerful use of the Internet for efficient download, quick page loading and streaming of media files. The current WPA2 coding provides for boundless WLAN surfing fun and makes possible in interaction with "Conceptronic TV FULLHD of STREAMER GBIT LAN" the wireless integration of your films, pictures and music. Note: Before you insert the card or connect the USB Adapter to your computer, you must install the Drivers & Software!